Flying alone with a two month old across the country this past weekend has increased my faith in humanity. I have never run across such helpful, nice people when flying as I did this past weekend. People offered to lift my bags, guide me to my gate and watch my bags for me. They smiled at Clara, offered me their place in line and asked if I needed any food or water. Every step of the way I met the nicest, sweetest people and I am grateful to all of them for making my trip so easy. Clara, for her part, was a great travel partner. She thoroughly enjoyed the unlimited mom time without a toddler trying to poke her eyes out, and I got to see family and pay my respects to a wonderful man and grandfather. Lovely as the weekend was, it was so nice to come back and be home again with my toddler. She was so excited she threw tantrums and napped short for me. Motherhood is the best, isn't it? Since motherhood for me also includes making dinner, I made sure to add some meals to the meal plan for the week that were personal favorites, and this chicken was one. 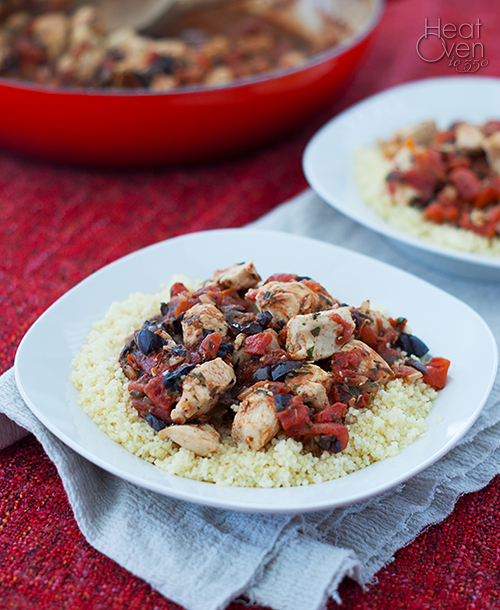 Easy and full of great Mediterranean flavor, this is the type of weeknight meal I love. The basil gives it a happy, fresh flavor, even though most of the ingredients are things I just have stocked in my pantry or fridge. I love how the kalamata olives lend saltiness to the meal. This is one of those times when they are such a star in the meal that regular black olives are just no substitute. 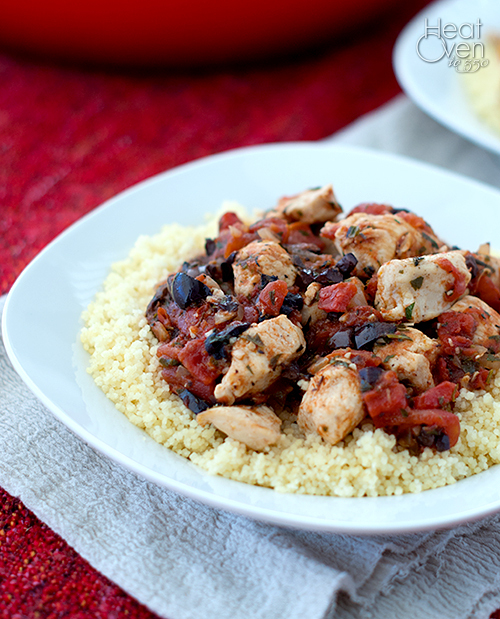 I also love serving this over the plain couscous because it gives it such a great texture. You could easily substitute quinoa or some brown rice if you wanted. If you want a fast, easy, healthy meal with unique flavor, this is the one. Heat the oil in a large non-stick skillet. Add chicken and cook, stirring frequently, until all sides are browned but the chicken pieces aren't completely cooked through, about 4-6 minutes. Remove the chicken to a bowl. Add the chopped onion to the now-empty skillet and cook until the onion is starting to soften, about 3 minutes. Add the garlic and cook and stir 30 seconds. Add undrained tomatoes and bring to a boil. Reduce heat and add chicken broth, vinegar, sugar and thyme. Simmer for 10 minutes. Add chicken back to the skillet, cover and cook until chicken has cooked through, about 5 minutes. Chop kalamata olives finely, then add to the skillet with the parsley and fresh basil. Cook 1 minute, season with salt and pepper and serve over cooked couscous. Sorry for the reason you went on your trip but happy that the baby did fine - love that people were so helpful too! I am 46 years old and I am JUST starting to like olives - yum!